Cloud technology has become an integral component in digital transformation plans for businesses. As cloud offerings continue to expand and evolve, it’s essential for companies to understand the various cloud environments and their differences to identify the right solutions for each. 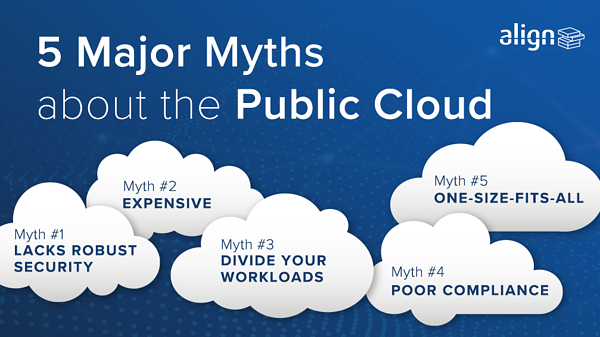 In this blog, we’ve dispelled five major myths about the public cloud. You might be surprised what you find. According to a 2018 Microsoft study, over 87% of non-public cloud users mentioned that security was a primary concern for their organization. This misconception stems from the idea that storing sensitive data and documents in shareable locations makes organizations more vulnerable to data breaches. The reality is that 29% of public cloud users report greater data security when deploying data-sensitive applications. Not only are all of your files encrypted, but most public cloud service providers (CSPs) offer constant monitoring to track and mitigate potential threats to your organization. It’s also recommended that companies continue to stay up-to-date with cybersecurity best practices and continue to educate employees with continuous cyber awareness training on a routine basis. Another myth surrounding the public cloud is that it is difficult and a heavy financial burden for businesses to migrate to. In fact, 87% of people who weren’t on the public cloud reported that they expect to spend $500k or more annually to run multiple workloads on a public cloud platform. After a more holistic look at the data, Microsoft found that this was not the case and the companies who spent $500K+ were the ones running an average of six major workloads on the public cloud. The public cloud model enables customers to only pay for the resources that they consume, as they consume them. There is no need to invest in capital costs such as Storage, Processing Power, Rackspace, Colocation facilities and other on-premise necessities. Using multiple cloud service providers is helpful in preventing system overloads. However, using certain providers to optimize and support a single type of workload is never necessary. In fact, it increases frustrations and negatively impacts productivity as users are required to log into multiple systems and set each one up. Some Public CSPs simplify this tedious process by offering solutions like a single-sign-on (SSO), which allows cloud users to log in to all their programs with a single login. Many organizations say that working with a third-party cloud service provider will make it harder to comply with data protection regulations. Although not every cloud service provider can meet the specific requirements of your industry, there are many public CSPs out there that can. This is where performing adequate due diligence when evaluating IT managed services providers and managed cloud solutions comes into play. The ideal public cloud service provider for your business will understand the importance of meeting security, cybersecurity and privacy requirements. They’ll review your data and assess your environment to determine the best solutions for your business to help mitigate risks and meet compliance requirements. An example of this is Microsoft Azure’s platform, which has over 70+ compliance offerings and meets a range of international and industry-specific standards. Their platform has rigorous third-party audits that verify Azure’s adherence to various security policies. The concept that the public cloud is a one-size-fits-all solution is entirely false. The public cloud is a versatile platform that can offer sophisticated solutions to meet your unique business needs. The flexible, scalable nature of this cloud computing environment is the ideal solution for companies looking to reduce costs, minimize waste of resources and grow seamlessly by scaling up and down as needed. One of the top benefits the public offers customers is the ability to use the resources you need; instead, of having to purchase a one-size-fits-all solution that ultimately won’t suit your unique business needs. Is your firm still on the fence between realizing the benefits of the public cloud? Are you seeking more information on various cloud solutions? Align is a Microsoft Tier 1 Cloud Solutions Provider and Gold Partner, as well as, an AWS Select Consulting Partner. We offer multiple managed cloud solutions to fit the needs of your business and has extensive experience delivering the public cloud to customers. Reach out to us by clicking here or on the button below, and one of our cloud and IT experts will reach out to you.